The discovery and development of pharmaceuticals is a high-risk, long-maturation endeavour requiring the participation of many groups and research institutions. This process can be facilitated by the existence of a social and economic environment that stimulates the creation of technology-based products by offering an economic reward for the usefulness and novelty created. Such is the case in developed countries, where the pharmaceutical industry is one of the most important if not the most important type of organization mobilizing scientific, material and human resources for long-term projects of medicine research and development. In this social model, molecules and active principles developed by the industry itself or acquired from third parties, after a long process of development, are transformed into medicines and made available for consumption through market mechanisms. Such entrepreneurial agents and the incentive mechanisms associated with these economic environments are often absent in developing countries, as their pharmaceutical industry is often directed toward importing medicines or producing copies of products from developed countries. Human and material resources that could allow the creation of medicines exist in universities and research centers in developing countries. However, they are dispersed, and seldom organize themselves for multidisciplinary, long-term projects such as the research and development of pharmaceuticals. 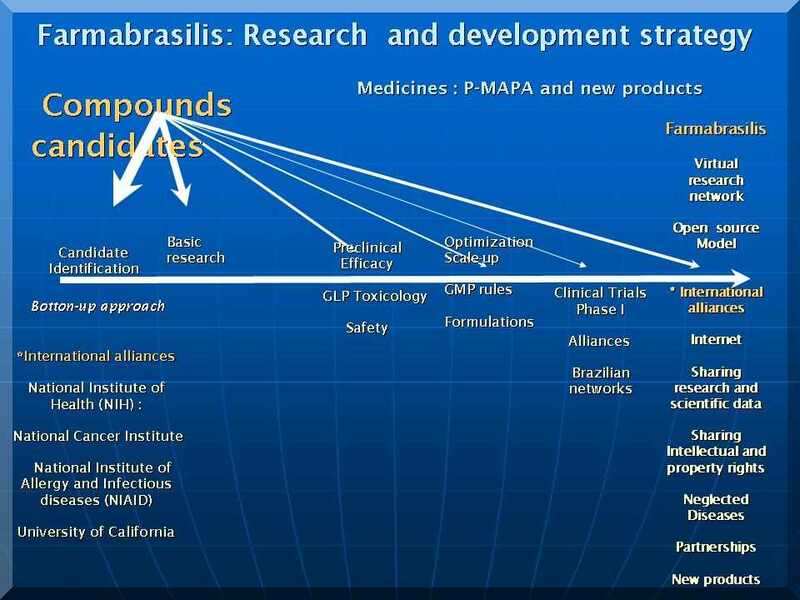 In order to overcome this gap and evolve its projects, Farmabrasilis is bent on building a pharmaceutical research and development environment, unique in South America. This environment has been created and is maintained by the interaction and teamwork of researchers, scientists, volunteers and organizations from the civil society, pooled around Farmabrasilis in long-term projects for the development of medicines for the benefit of excluded populations. A non-profit organization congregating researchers from Brazilian and Chilean universities and members of the civil society has been the starting point for the construction of the international research network of Farmabrasilis. It harnesses competences and resources, and directs them to the various stages of medicine creation, from basic research to clinical trials. - Our organization and its collaborators identify the most promising active principles and molecules that might be a starting point for new medicines. - From this selection, and by means of the volunteer work by devoted scientists and collaborators connected by an international research network, innumerable tests and activities are set in motion until all research stages are fulfilled, and the the selected active principles and molecules can be regarded as potential medicines. - In the final stages we seek partnerships with companies, non-profit organizations, and different institutions with an interest in promoting human and social development, particularly for the benefit of excluded populations, in order to complete the stages of clinical research, technology licensure, manufacture and distribution of these new medicines, which might have a significant impact in the health of the target populations. - When appropriate, our medicines can be licensed without royalties in order to allow their use by populations that would otherwise be unable to purchase them. Guided by these principles, Farmabrasilis functions by means of strategic partnerships with companies, non-profit organizations, hospitals, universities, governments agencies, research centers, individual researchers and people with different backgrounds and talents, and has been able to keep together for 17 years all the elements necessary for the success of its research projects. The results are now being delivered to the public in the form of a range of medicaments and technologies: P-MAPA, a state-of-the-art immunomodulator, for infectious diseases and cancer; violacein and its derivatives, for use in tropical diseases; and other important medicaments now in an advanced stage of research. Our product research environment and our creation and dissemination strategies for medical technologies in favour of excluded populations are a pioneering initiative that, we hope, can be of assistance for other organizations seeking solutions to problems plaguing these populations. Our research network is open to receive and help other researchers working in the health care area to overcome the gap between scientific discovery and its transformation into medicaments and products, by means of partnerships and joint projects. Farmabrasilis also participates in other top brazilian research networks through our researchers and their teams, in order to set up new alliances and expand the possibilities of creation and development of products and their application.